show that sea ice now covers less than 30 percent of the ocean’s surface. The National Snow and Ice Data Center, a government-sponsored research agency in Boulder, Colo., announced the findings on Monday in collaboration with NASA. 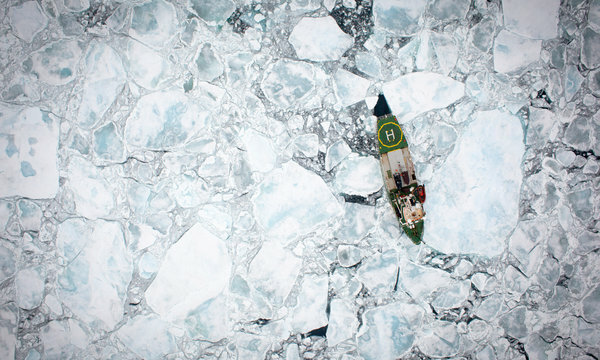 The amount of sea ice in the summer has declined more than 40 percent since satellite tracking began in the late 1970s, a trend that most scientists believe is primarily a consequence of the human release of greenhouse gases. Scientific forecasts based on computer modeling have long suggested that a time will come when the Arctic will be completely free of ice in the summer, perhaps by the middle of the century. This year’s prodigious melting is lending credibility to more pessimistic analyses that that moment may come much sooner, perhaps by the end of this decade. Experts say that a powerful storm in the Arctic this month almost certainly contributed to the record by breaking up ice. But the record low would not have occurred, they say, if the ice had not been steadily contracting for the past several decades. The pace of that decline seems to be accelerating. But scientists are somewhat cautious in their predictions, given that sea ice is prone to natural variability. They have only a 33-year record of careful satellite observations, and before that, only sketchy data from maps and other historical sources. By itself, the melting of sea ice does not raise global sea levels, because the floating ice is already displacing its weight in seawater. But the sharp warming that is causing the sea ice to melt also threatens land ice, notably the Greenland ice sheet, which is melting at an increasing rate. Melting land ice does raise sea levels. Already, the reduction in sea ice is altering weather patterns in the Arctic region, and perhaps beyond. It is putting stress on the ecology of the region and causing rapid erosion of shorelines that are now exposed to more vigorous waves. The melting does, however, offer some potential benefits, including new shipping routes and easier access to oil and other mineral deposits. A rush is on to stake claims and begin mineral exploration in the Arctic. The average temperature of the region is rising more than twice as fast as that of the earth as a whole, confirming a prediction first made in 1896: that increasing levels of carbon dioxide from the burning of fossil fuels would have an especially large impact in the Arctic. One reason is that the white surface of the ice reflects a great deal of sunlight back to space, but the darker water and land exposed when the ice melts absorb more heat from the sun, which in turns leads to additional melting, more sunlight absorption and so on — a feedback loop that scientists call Arctic amplification. Dr. Francis is one of a small group of climate scientists who argue that the decline of sea ice is already having consequences for weather in the Northern Hemisphere’s middle latitudes, including in the United States. She has published research suggesting that air circulation patterns are being altered in a way that favors more extremes, like heat waves and droughts. Every year, the surface of the Arctic Ocean freezes during the long, dark winter, with the extent of sea ice usually peaking in March. Until recent decades, a high proportion of the ice was thick enough to survive the summer. But scientists say the warming trend has reduced the ice to just a shell in many places. The means it can melt easily in the round-the-clock sunshine that strikes the highest latitudes in summer.